We have worked with BaseballSoftballUK, the official development agency for both the BBF and BSF, to develop packs of equipment in conjunction with their Hit The Pitch program. These packs are designed to incorporate everything you need to start playing the sports. These are aimed at setting up a team rather than for an individual person or player. 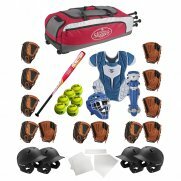 Each pack is for a specific age range of team and the type of equipment reflects this.